It's Monday morning. Are you wondering if your ministry to kids at church yesterday made any difference at all? With a fresh approach to spiritual formation in the lives of kids and their families, this audio book will reawaken your passion for ministry and give you new vision for what is most important in the lives you shepherd. 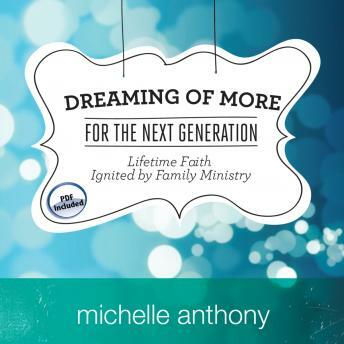 Dr. Michelle Anthony shares stories that will inspire you and provide the tools you need to: • Partner with parents to equip them as spiritual leaders in their homes. • Motivate children and teenagers to step out of their comfort zones and into a lifetime of faith. • Create intentional space for the kids in your care to meet Jesus. Dreaming of More for the Next Generation is not program-driven—it encourages you to be Spirit-driven as you minister to kids and their parents.